Pink Sky: Back to Sewing! I have been absent from the ol' blog, but that means I've been busy with lots of projects! 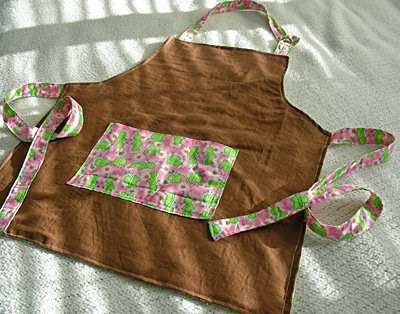 I made an apron as a gift for a friend. 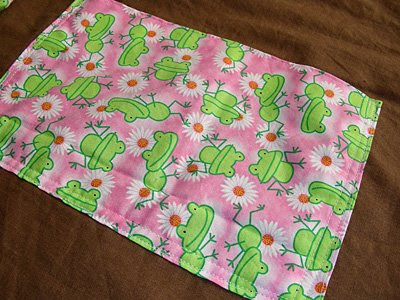 She loves to bake and loves lime green and frogs, so when I saw this fabric, I knew it'd be perfect for her! It's brown linen and cotton fabrics. I made the neck adjustable with D rings. 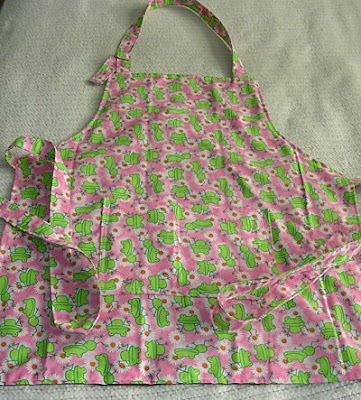 I couldn't decide if all frogs or just a frog detail, so I made it fully reversible with pockets on both sides so she'd do whichever one works best for her. I hope she likes it! I'm just happy to be back to sewing, it has been a while! Fantastic apron there! I wear one nearly all the time and think the idea of a reversible one is perfect.